Form: A low, spreading cushion (up to 1cm thick), with stiffly erect, semi-contractile papillae projecting above the sediment covered body. The hollow papillae are variable in number, and their length varies with age, condition and situation of the individual sponge, so that no two individuals ever look quite the same. The papillae show little tendency to fuse (contrast Polymastia boletiformis). The sponge is firmly attached to rock beneath the sediment. Colour: The body is dirty grey, or orange yellow in cleaner water conditions. The papillae are creamy-white to pale yellow. Consistency: The body is hard, and the papillae stiff. Surface: That of the body is hispid, roughened by projecting spicules which trap sediment particles, ranging from mud to fine gravel. 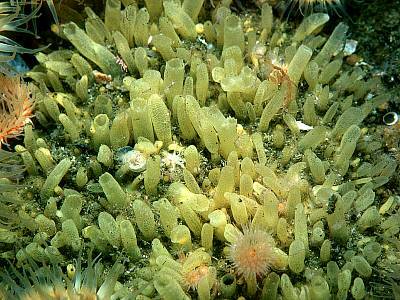 On a few occasions, when the surface is clear of sediment, the sponge may be seen enveloped in algae or bryozoans, etc. The papillae are smooth and clean; often a fine network of spicules can be seen on the surface. Apertures: The oscules and pores are carried on the cylindrical, slightly tapering, papillae. The exhalent papillae are large, few in number and, with the terminal oscules usually open, can be distinguished easily from the thinner inhalent papillae. The pores are located towards the upper ends of the papillae, but are not obvious. Skeleton: Radiate, with a well-organised ectosome. The skeleton of the papillae is continuous with that of the main body. There is one category of spicule (tylostyles), divided into three size groups. The larger (a) constitute the main structural megascleres, forming stout, multispicular tracts (up to about 15 spicules thick), which run up through the body and on into the papillae, partially piercing the surface. Loose spicules lie scattered between the tracts. The middle-sized tylostyles (b) form a tangential layer of inter-crossing spicules just below the surface (2 - 4 spicules deep), supporting a single layer of the smallest megascleres (c) which are arranged perpendicular to the surface, grouped into brushes. 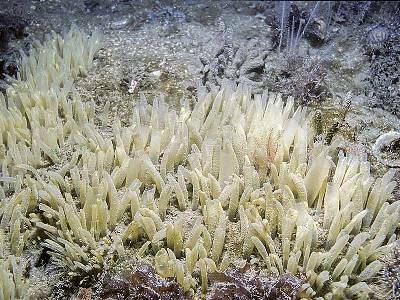 In mature sponges these spicules become more tightly packed, forming a palisade. The multi-spicular tracts give support to the walls of the papillae, with a similar ectosomal arrangement to that found in the body. Spicules: The megascleres are (tylo)styles of three sizes. The spicules of the tracts (a) are 950-(1070)-1200µm, straight and fusiform, with virtually no swelling at the heads. Those of the tangential layer (b) are 250-(500)-725µm, usually with a slight swelling near the head end. The spicules of the surface brushes (c) are 115µm-(140)-175µm long, curved, fusiform, with ovoid tyles at the head. There are no microscleres. Habitat: This species is usually found on upward facing rock (rarely on boulder tops), or at the sediment/bedrock interface with the body beneath a layer of sediment. Never found out in the open on bottom plains as Polymastia boletiformis Prefers conditions where some silt is held in suspension by flowing water? Confirmation of these features is needed. Its preference for silty conditions makes it more easily overlooked than Polymastia boletiformis. "Littoral to 2300m." Distribution: "Arctic; Atlantic coasts of Europe and N. America; Mediterranean." 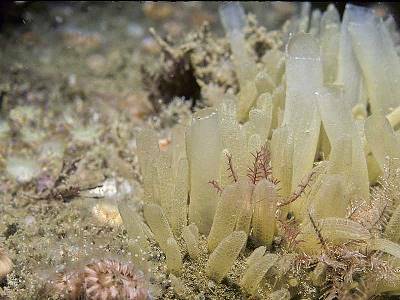 Recently known from many sites on the western and southern coasts of the British Isles. Identity: There are several papillate species with which Polymastia mamillaris and Polymastia boletiformis could be confused; the recent revision of this Genus by Boury-Esnault, (1987) should be consulted for descriptions of other species (including Bowerbank's other Polymastia spp.). BEP believes several other species, some probably undescribed, to be not uncommon in some localities; they may easily be confused with Polymastia mamillaris. Voucher: BELUM : Mc1310. Maidens, Antrim.